I was in Paris a week ago and thought it was the perfect timing and place to re-read The Secrets of Darcy and Elizabeth by Victoria Kincaid as that is pretty much were this story begins. What if Richard finds Darcy in such a state of sorrow that he insists his cousin must go with him on a trip to Paris? And what if instead of going to the Lake District as planned, Mr. Gardner had business in Paris and invited his niece Elizabeth to go there with him and his wife? What are the chances of Mr. Darcy and Elizabeth finding each other at a ball on the most romantic city there is? Paris is my favourite city in the entire world, so this book was already in my heart even before I started reading it! But guess what? I read it, the story goes from Paris to London and the book continued to surprise and delight me. I loved the Paris scenes! I could truly feel I was there with the characters. The book was written in such a fashion, and the places so well described that my imagination took me river banks with Mr. Darcy and Elizabeth. For the first time, while reading this book, I really felt inspired to write a story of my own. 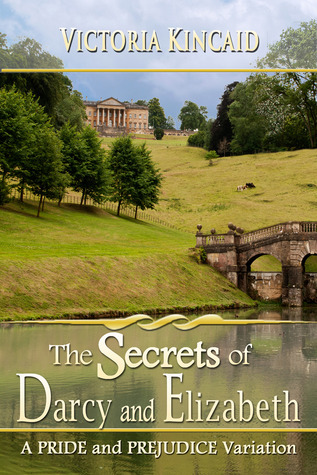 Of course I didn’t do it, I would probably write a miserable book, but the point is, The Secrets of Darcy and Elizabeth was so good that it inspired me to do it! To tell the truth, it is hard to say which my favourite part of this book was. There were so many interesting scenes that I could not pick just one. I think that’s also why I got inspired to write. This book is very rich in terms of scenarios and dialogues. The entirety of scenes in France is splendid: from the ball to the walks along the Seine, to the escape from Paris and the dialogues in the carriage (which I found interesting, witty and flirtatious), to the intensity of the scenes during the illness and the adrenaline of the return to England. I also enjoyed 2 other aspects in this book that I must mention: to see a jealous Darcy and to see the characters in love but not together during a great length of the book. Even though jealousy is something we often see in JAFF, I always adore it! Always!!! In this book, we see a jealous Darcy, but not because he sees Elizabeth as his possession. He is jealous because he is insecure of her love for him, and that is just too sweet to see. I wanted to enter the book, become Elizabeth and tell this Darcy he had no reason to worry about! The fact that the characters knew they loved each other, but not being able to be together is something that I haven’t seen that much, and I truly enjoyed it. It gives us the romantic glimpses we all love, but also a bit of angst for not seeing them together. I truly enjoyed this. Rita, this is my favorite book by Victoria Kincaid! Wonderful review. I laughed so hard reading this book. I’ve been thinking about it lately too, with everything that’s happened in the world. I loved how Darcy would refer to the fact that Mr. Bennet should be happy with their union. Those were great lines! I love the idea that this was set partially in Paris. It’s fun to imagine Darcy and Lizzy in a new setting. The different twists and his jealousy sound fun, too. Nice review! It was very interesting to see the story placed somewhere else Sophia, and for me Paris was just perfect. The storyline is out of the ordinary and incredibly creative. I really liked it! Rita, Thank you for such a wonderful review! It’s so heartwarming to know I wrote something that dedicated JA fans want to re-read. You made my day! I can’t believe that I seemed to miss this title. Thanks for sharing your review, I’ve added it to my wishlist. Another one that I loved.